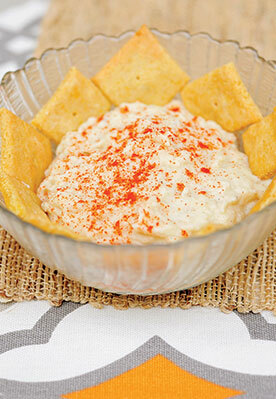 Light and fluffy, this snack tastes even better than traditional hummus. It has all the wonderful flavours of a fabulous Greek snack, but without the difficult-to-digest legumes. 1. Place a steamer basket in a medium pot and fill the pot with about 2 inches (5 cm) of water. If you don’t have a basket, use a colander on top of your pot. Bring the water to a boil. Place the cauliflower florets in the steamer basket or colander. Cover and allow the cauliflower to steam for 8 minutes, or until soft. 2. Transfer the cauliflower to a food processor. Add the tahini, lemon juice, olive oil, garlic, salt and pepper. Blend until smooth. 3. Dust with smoked paprika, if desired, before serving. Recipe taken from Super Paleo Snacks by Landria Voigt (£14.99, Fair Winds Press).